← Too relaxed to read? Kind of a Niche Market/Luxury Thing? OK, imagine it’s 1934 and you need a pen. What kind of pen are you going to get? You’re going to get a fountain pen. It’s 1934 remember, there are no ball points, no rollerballs, no Sharpies for writing, it’s a fountain pen or it’s a quill, these are your choices. So you drop your eight shillings, your buck twenty-five, a handful of fenigs whatever and you walk out the store with a fountain pen: a bladder that delivers ink to a nib, in a cool looking bakelite delivery system. So, sure, it requires some maintenance, it’s a bit messy, it needs your frequent attention but you don’t care, you don’t know any different and it writes so well, it feels so good in your hand. You’re happy. Ah! But now it’s 1938 and the Bíró comes along, and then the Bic. Sure it’s cheap and cheerful but hell, it only costs a nickel and this thing isn’t going to leak in my pocket. There has been a change. Progress has reared its ugly head once again. But does the fountain pen die out? No, it does not. Here we are a lifetime later and you can still buy a fountain pen. You can get one in Staples for $16.00 or you can get a Mont Blanc for $1,600.00. Fountain pen sales may now only account for the smallest overall percentage of pen sales but, it is a profitable market for someone out there. You don’t need it, you’re probably not going to use it, but it looks great and it feels great and it sure would make a nice graduation present. Now that e-book sales are pretty much neck and neck with print books sales. Doesn’t that mean that half as many real books, sorry, print books are being manufactured? And doesn’t it follow that a few years down the road, used books are going to start getting kind of scarce? Like petrol in The Road Warrior? And that used books are going to get kind of pricey? Kind of a niche market/luxury thing? 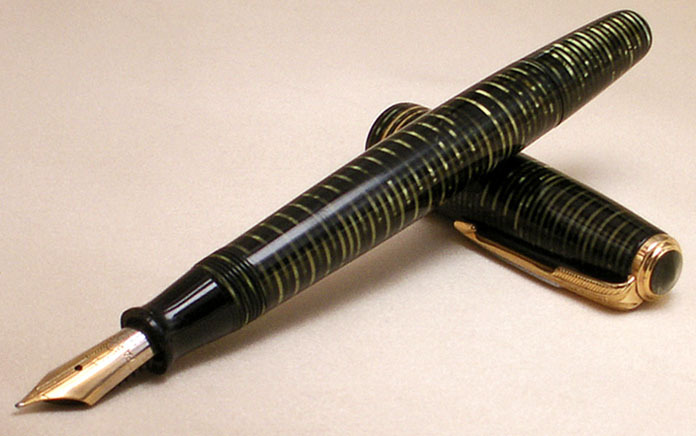 If you go on eBay you can get a really nice, refurbished and working Parker Vacumatic fountain pen for around $200. (I highly recommend it). 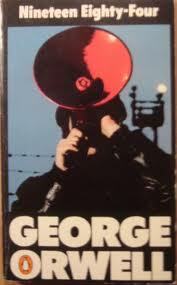 In 2034 there may well be a store on or around 5th Avenue where you can pick up a Penguin Classic of George Orwell’s 1984 for around the same price – if no one’s watching. This entry was posted in Paradigm Shift and tagged book culture, e readers, Kindle. Bookmark the permalink.